Rare and wonderful, 1860's Civil War Sixth Plate, Hand Tinted Tintype Photograph of a Union Soldier!! This outstanding, period Tintype Photograph measures approx. 2 5/8" by 3 1/4" and is housed in what appears to be its original, pressed leather hard case. The Tintype is a wonderful, 3/4 length, seated portrait of the Soldier wearing an enlisted man's frock coat, kepi and finely hand tinted blue uniform trousers. The Soldier strikes a rather relaxed pose sitting with his left elbow resting on the back of the chair that he is sitting on. Neither the soldier nor the photographer is identified in any way. 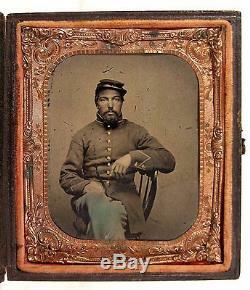 This very rare and wonderful, Civil War Tintype Portrait of a Union Army Soldier is in very good condition. The focus is sharp, the contrast strong and the tonality rich and warm. The Tintype has some unobtrusive shallow bends and a small area of surface lines at the center of the bottom edge but overall the Image is well preserved and displays very nicely. The surface is sound and stable with no significant crazing and no active flaking!! The original pressed leather case is well preserved with an old and expert spine repair. A rare and wonderful, 1860's Civil War Sixth Plate Hand Tinted Tintype Photograph of a Union Army Soldier and a fantastic addition to any collection! And Click Here to Add Us To Your Favorite Sellers List. Click Here to Discover More About this Item and Many Others on Our New Informational / Non-Commercial / Reference Blog - Walnutts. The item "1860's CIVIL WAR 1/6 PLATE TINTYPE PHOTOGRAPH OF A UNION SOLDIER with HAND TINTING" is in sale since Friday, August 07, 2015. This item is in the category "Collectibles\Militaria\Civil War (1861-65)\Original Period Items\Photographs".